The current place name, Owashi appears in the form 'Osakihama' in the article on the beach areas of the Shimane district in the Fudoki. The paragraph on shrines in this area lists two, 'Osaki yashiro', 'Osaki Kawabe yashiro' suggesting it's an area rich in history. Going with the flow of history it could be possible that originally 'Oosaki' evolved into 'Ooashi'. But in reality, the current name could feasibly be read as 'Owashi', 'Oashi', 'Ooashi' which leads to quite a confusing mix. In other words, all these readings could be the result of linguistic mis-readings/ mis-hearings. But, over a period of 1300 years, could it really be possible to mishear and then mis-communicate the word 'saki' , into 'ashi'? Realistically, if it's believed that these leaps of pronunciation were due to misunderstandings, then could it not be believed that they were because of an official change in place names? Historian Kato Yoshinari, in his 1998 book 'Izumo no kuni no fudoki' referred to the characters read as 'Oosaki' as 'Oohashi'. Saki can also be thought of as a similar meaning to the character read as 'hashi' when referring to something ahead, in advance. Using this theory, it's not hard to see how a mishearing may have adjusted the sound from 'hashi', to 'ashi'. From here, the next question is, what is the connection between the 'Kunishi Daimyoujin' of the Edo period and the two shrines listed in the Fudoki? The common name for Oosakikawabe jinja is 'Kunishi san', (written with the characters 'country' and 'master') . This name originated during the Edo period from the shrine named 'Kunishi Daimyoujin' (with Kunishi written as the characters which mean ' governor'.) Oosaki jinja, on the other hand, is commonly known as 'Hansaka san' , which of course sounds nothing like 'Kunishidaimyoujin' suggesting any possibility of a connection to Oosaki jinja as very slim indeed. According to the "Unyoushi" book, the enshrined god of Oosaki kawabe Yashiro , known as 'Kunishi san', was Izanagi no mikoto, while the god of 'Oosaki yashiro' , (Hansaka san) was Izanami no mikoto . It's likely this basic connection was established a long time ago. 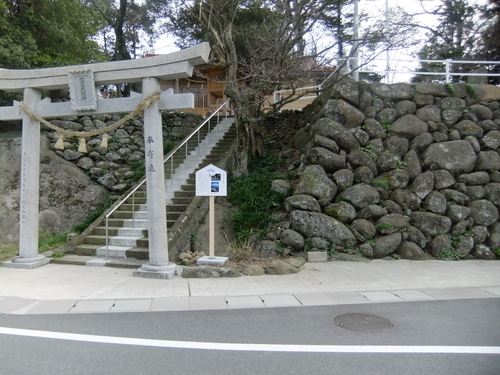 Ozakikawabe shrine is positioned farther inland than Osaki jinja. The Unyoshi says that "....upon seeing the amount of soiling at the scene where Izanami-no-mikoto gave birth, Izanagi no mikoto went to the salt tide water and purified himself. As a monument to this, he built a shrine. 'Ozaki kawabe'. All people in the area come here to draw water, cleanse and purify themselves." This is the basis for the entire 42 ura pilgrimage. 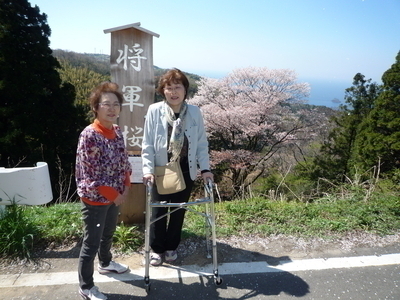 Advancing eastwards along the beachfront cliff road from Mitsu-jinja will bring you to Oashi Bay. Peering down to the base of the cliff from the uppermost part of the sloping road on the Shimane town side gives you a view of a popular landscape that looks like rippling waves frozen in motion. It is known in the area as a 'washing rock'. This is a particularly interesting geological formation in view of the mythology which says Shimane Peninsula was formed when the land was 'pulled together'. Oosakikawabe shrine is located on the mountain side behind a general/ fresh produce store in the Shimane town area further on along the coast from Mitsu jinja. 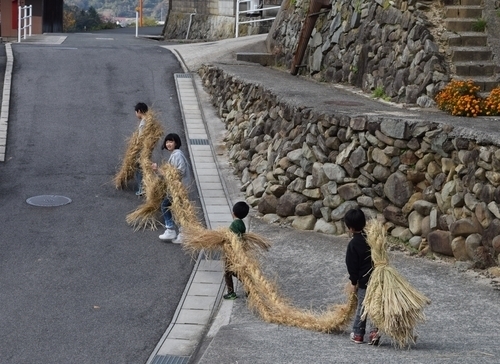 A straw serpent measuring anything from 20 to 30m is made as part of the 'Koujinsai', (also known locally as Chiinamaita), a festival held every year from October to November to calm the tempestuous kami (god) of Oashi, Susanoo-no-Mikoto. The ritual takes places along the beach and in 5 other nearby areas. 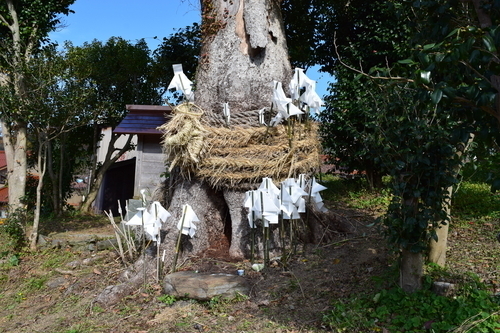 Rather than worshipping at the sacred trees in the shrine grounds, prayers are said to Koujin by all the trees in the area along the mountains at the rear of the village. In the beach area, an eight-headed Orochi serpent is made, in the inner areas of the bay ,local children take the snake and hide it. The adults have to look for it and candies are exchanged upon finding the serpent. In Heisei 9 (1997), the field visible right below the shrine became the spot for the cultivation of 150 fig trees. In Heisei 21 (2009) led mainly by women in neighboring towns interested in raw food materials, the 'Shimane town Seabreeze Group' was formed. As part of the group's activities fig jam, youkan (sweet bean jelly) and ice cream are sold. Fig cultivation is said to benefit greatly from a sea breeze, so all the trees are within 500m from the shoreline. The fig products are also sold at Matsue Products Tourist Hall and at 'Marine Plaza', the port where the Kukedo pleasure boat docks and departs. 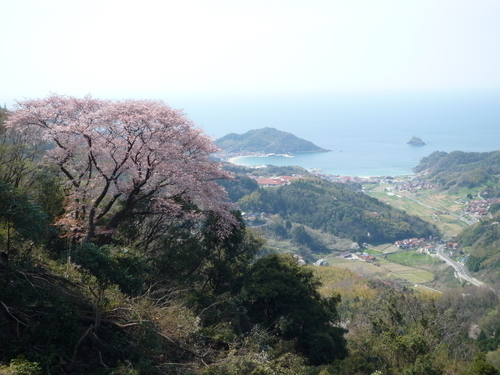 When the peak cherry blossom viewing time has passed in Nonami's "Cherry Road" area, plenty of wild cherry trees can be seen on the upper mountainside south of Osakikawabe jinja. Coming from the direction of Matsue, stay on the left of the sign for 'Matsue Gakuen' and keep the Shimane Town Athletics Park on your right, you'll come to a forest road, go down here and you'll see several signs leading you to wild cherry blossom tree viewing spots such as 'Shogunzakura' and 'Tengu zakura'.